This journal's name has been changed. 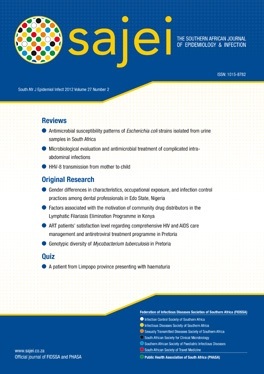 Contents of the Southern African Journal of Epidemiology and Infection are available in the tab below, however the journals is currently known as the Southern African Journal of Infectious Diseases. What is the link between vitamin D and tuberculosis? Using reusable containers for hospital waste: is there an infection risk? Enter your details below to subscribe to Southern African Journal of Epidemiology and Infection. Have a question about Southern African Journal of Epidemiology and Infection? Call us on +27(0)46 622 9698 or submit an enquiry using the form.